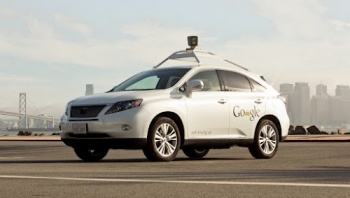 According to Google, the self-driving car is ready to ferry its employees to work. Driverless cars have been a widely-held goal for some time now, with their potential applications extending from allowing visually impaired people to travel independently to increasing safety standards thanks to the lightning-fast reaction times provided by the technology that drives them. Having unveiled its self-driving car project a few years back, engineers from Google this week revealed that since then, their fleet of twelve driver-free cars has driven over 300,000 miles without incurring any accidents. Thanks to this success, the cars are apparently now ready to drive Google employees to work alone. While we don't know just how many of those miles were covered on Google's controlled test track, we do know that the cars have been tested in a wide variety of traffic conditions and roads. This demonstration, in which a visually impaired man experiences the freedom of piloting a driverless car to Taco Bell, showcases the car's quick response and generally reliability. Up until now, however, the cars have always required a team of at least two road-proficient humans to monitor them whenever they've gone out on the road. According to Google, the next step will be for drivers to head out in the cars solo, staying in the driver's seat (with one foot on the brake pedal, one presumes) for the duration of the journey. In addition to this, Google is planning to train the cars in how to handle wintery weather, temporary construction and diversion signs, and other "tricky conditions" that drivers tend to encounter on the road. The company is planning to use the newly-added Lexus RX450h self-driving model to achieve this. While it would be hard to imagine a sensible human being agreeing to be driven around by a set of computers right now, it increasingly seems to be the case that that might not be such a ludicrous idea in the future. 300,000 miles without incident, even though some of it was undoubtly spent in super-safe test areas, is no mean feat. Will we one day trust these machines to ferry us, sci-fi like, from place to place? Would you ever trust such a car? Will it get annoyed at the constant back-seat driving it'll no doubt face? It seems we might find out sooner than many of us expected.